Thunder, lightning and heavy rain did not deter my enthusiasm for checking out the new Kelly Camper. It’s smart, innovative and could be bulletproof… although I didn’t test it for that. The first thing that you will notice is that the Kelly Glenrowan II is boxy. We’ve all become accustomed to how a camper looks, but this one is different – and it attracts people like kids to the biggest present under the tree. The powdercoated aluminium body hides the fact that the top lifts up to a height that would allow even the tallest bushranger to stand tall inside the camper. The extension of the pop-top requires no more effort than opening the back door and pressing one button – which operates the electric actuators located at each corner of the camper. If you arrive at camp and it’s pouring with rain, no problem; you can sit inside the van, close the door, and still operate the roof with ease. The design of the Kelly Camper has taken old problems and solved them with innovative twists. One example of this is the placement of the spare wheel on the back: It is located in a metal frame that drops down with ease due to gas struts; and putting it back in place is just as easy. But that’s only for starters – it gets better. The spare wheel frame is then used as a step into the camper. The best bit is that if you need to change a flat tyre, just slide the wheel out and slide the flat one in. No need to lift a 35kg wheel! You don’t need to be a weight lifter to change a wheel anymore. Although newcomers to the world of campers, the Kelly Campers have a solid pedigree in industrial design and in aluminium and stainless steel fabrication for use in testing environments. The factory manager worked on aircraft for many years, where quality and reliability is critical. The campers are designed from the ground up using the company’s own CAD program that allows customisation for individual customer needs. Kelly makes its own stainless steel kitchens from only the best in stainless steel – providing a higher quality product than most. The 150L water tank is baffled and made of 316-grade stainless steel; and it’s fabricated in-house. The Glenrowan II has an aluminium skeletal frame with polystyrene insulation between the internal and external sheeting keeping the camper light, cool and incredibly strong. 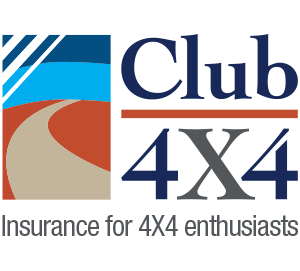 The independent rolling lobe air-bag suspension is more than suited to the rigors of serious off-roading. The bags also allow the camper to be levelled or raised on uneven ground. Once the roof is raised, the white interior and four large windows in the pop-up section give a feeling of spaciousness to the interior. The bed is a queen-width inner-sprung mattress in two parts, zippered together, that can be folded over – allowing for a two-seater couch and table to be accessed. Next to the bedhead at the front of the camper there is a small bedside table (on each side), with storage underneath – perfect for resting books and devices. On each side of the door as you enter there are large cupboards suitable for clothing and similar items. Under the bed there is a large linen drawer suitable for spare bedding and towels. On top of the cupboards are stereo speakers and also 12V charging points to keep your mobile devices working. On the left side as you enter, the control switches can be found for the roof, lights, voice-activated stereo and REDARC battery management system. Opposite and behind a door is the 165Ah AGM battery. This is charged (while the camper is stationary) by two 150W REDARC solar panels mounted on the roof. A fire extinguisher is also mounted here for easy access; as are two 240V outlets. The door can be deadlocked on the inside so that you can sleep securely. All the external doors/hatches can be locked – so if you need to leave expensive equipment in the camper while you go for a hike or a fishing expedition, you can be confident it will still be there when you come back. When the storage doors are opened, a heap of necessities and luxuries are revealed. Firstly the kitchen is large, well made and very functional as it slides out of the front of the left side of the camper. It houses a Dometic three-burner stove with electric ignition, and a good-sized sink with hot and cold water. Did I mention innovation before? The shower has a hard roof that folds out on the driver’s side, with warm water. There can be problems with outdoor showers: Where does the water go; and how do you keep from getting muddy/sandy feet (even with mats under the shower)? Kelly has fabricated a shower tray that collects up to 20L of grey water that can be wheeled away and emptied some distance from the camper. I like that! There are gutters on the kitchen and rear/door side to channel the water away from you if it rains (or storms, as in our case). The awning is by Supapeg so it’s easy to set up. It is L-shaped with options for side walls and even a zip to connect an RV5 Oztent should you need extra space. 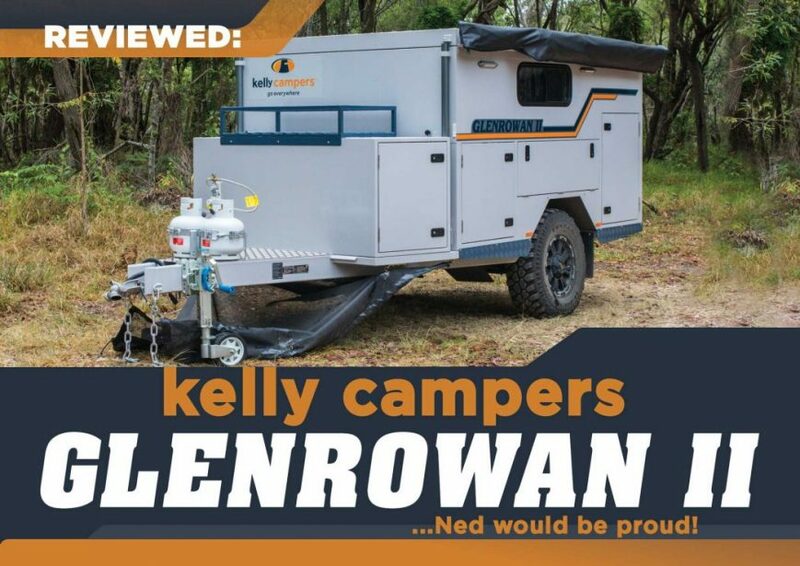 The Kelly Camper Glenrowan II is a solid but lightweight, quality Australian-made camper that will go anywhere. It is suitable for quick overnights but also will be comfortable as the base for a two-week stay. This is definitely a camper that you will see and hear more about. I reckon if Ned had a Glenrowan II camper, maybe he would have lived longer and travelled more.